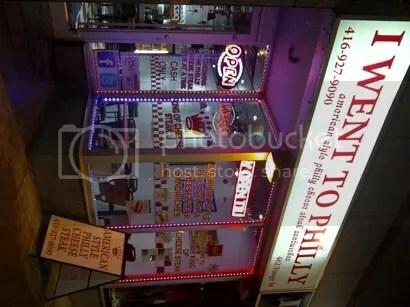 For our next voucher dining adventure, my hubby and I went to a placed called I Went To Philly. 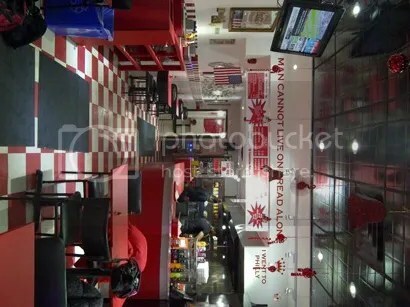 It’s a small place, with a few tables to eat in, and the now mandatory tv with CP24 on. It is a wee bit expensive though, with the most expensive sandwich in the $8 range, paired with fries you’d be looking at $13-$16 total. Our voucher included 2 classic Philly cheese steaks with ‘whiz’ (we added onions and peppers to it), 2 hand cut fries and 2 cans of pop. What we got were two HUGE, beautiful white buns, filled with the steaming hot goodness of thinly shaved steak and cheese smothered on top. The steak was like butter, and paired with the cheese, it was so addicting – I ate the entire sandwich…omnomnom!! The fresh cut fries were just that…what more can you say…you can’t go wrong with fresh cut fries 🙂 I ended up leaving most of the fries, behind though, when I opted to eat the gargantuan meatwich. My hubby and I both agree, that for our health, we’re so very happy that they are located downtown!! 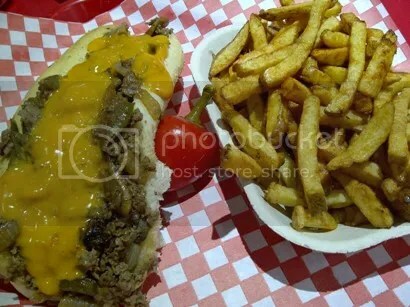 We’ll definitely go back again, though probably SHARE a side of fries next time LOL If you’re ever near the Yonge and College area, and in the mood for a pretty good Philly cheese steak, you should check them out yourselves.